A leading Chinese train car maker said Sunday that it has developed subway train made of carbon fiber, which is more durable and energy saving. CRRC Changchun Railway Vehicles said the new subway car is 35 percent lighter than traditional metal ones, which can effectively improve its carrying capacity, save energy and operational cost, and reduce the wear and tear on the subway line. 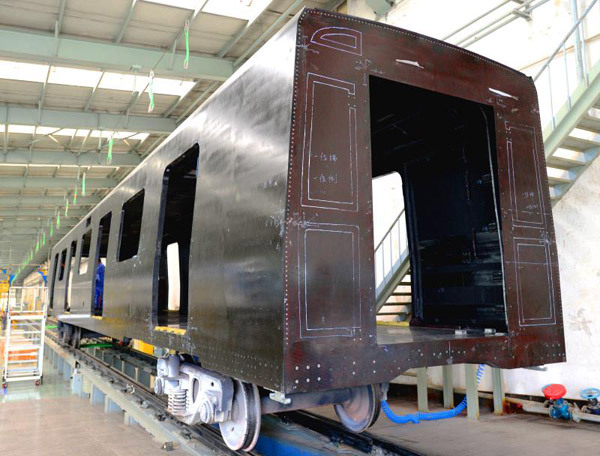 As carbon fiber can better resist fatigue, corrosion, and UV radiation, subway cars made of such material are expected to have an operational life of at least 30 years, said experts with CRRC Changchun. In addition, the thermal and sound insulation performance of carbon fiber is also better than traditional metal, which makes the new car more energy-saving and less noisy during operation. During the development of the new car, CRRC Changchun relied totally on its own technological innovation, thus owning the full intellectual rights of the new product, said experts with the company. A leading trainmaker in the world, CRRC Changchun has more than 18,000 employees and annually manufactures more than 8,000 trains. Its products have been exported to more than 20 countries and regions, including the United States, Australia and Brazil.